Ranjish.com has lots of Urdu Jon Elia Poetry. Feel free to add your own Jon Elia Shayari here. Find the best poetry of Jon Elia. 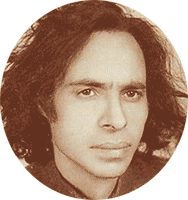 Jon Elia or Jaun Elia was a famous male poet from Pakistan. Some say that Jaun was not interested in publishing his poetry until his very last years. The reason behind this is believed to be his idleness for publishing his fathers poetry, which he was very ashamed of and later decided that he will not publish his own poetry too. . We bring you the best poetry of Jon Elia in urdu language. Jon’s poetry books were Shayad, Ya’ani, Gumaan, Lekin, Goya and Famood. Another belief is that a vast majority of his poetry remained unpublished and was lost during his time of death. Jon Elia was known to be fluent in Urdu, Arabic, English, Persian and Sanskrit. Abhi ik shor sa utha hai kahin..
Dil ki takleef kam nahin karte..
Ab koi shikwa hum nahin karte..
Khud hi larka sa main nikal aya..
Umar bhar ki umeed-vaari hai..
We update our poetry database on daily basis so keep coming back for more Jon Elia.